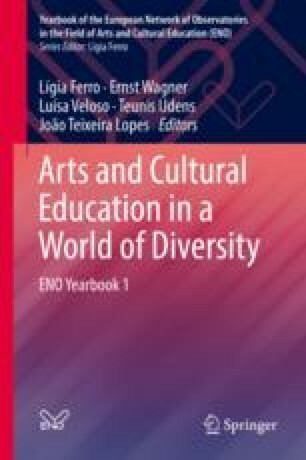 This chapter addresses the role played by arts education in the promotion of citizenship and human development, in the framework of the United Nations 2030 Agenda for Sustainable Development. Taking the Portuguese education system as a case study, we describe how arts education has been conceived in the national school curricula from the 1960s until today. We then discuss three emancipatory projects of arts education. de Assis, Maria, Gomes, Elisabete Xavier, Pereira, Judith Silva & Pires Ana Luisa Oliveira, eds. (2017). Spaces between arts and education. Lisboa: FCG. Online https://gulbenkian.pt/descobrir/wp-content/uploads/sites/16/2016/04/10x10_Spaces_between_Art_Education.pdf. Ferro, Lígia, Raposo Otávio, Cordeiro Graça, Lopes João Teixeira, Veloso Luísa, Nico Magda, Abrantes Manuel, Abrantes Pedro, Varela Pedro, Bento Ricardo, and Caeiro Tiago 2016. O trabalho da arte e a arte do trabalho: circuitos criativos de artistas imigrantes em Portugal, Lisboa, Observatório das Migrações. Online http://www.om.acm.gov.pt/documents/58428/177157/Estudo_OM58_br.pdf/521e91d4-f875-49cd-ba7a-36a6894c8618. Pires, Ana Luísa de Oliveira, Gomes, Elisabete Xavier, and Gonçalves, Teresa N.R. 2017. Reinventing spaces between art and education genesis, development and main conclusions of the research project. In de Assis, Maria, Gomes, Elisabete Xavier, Pereira, Judith Silva & Oliveira, Pires Ana Luisa, eds. Spaces between arts and education. Lisboa: FCG, pp. 91–116. On line https://gulbenkian.pt/descobrir/wp-content/uploads/sites/16/2016/04/10x10_Spaces_between_Art_Education.pdf. Wenger, Étienne. 2006. Communities of practice. A brief introduction. Communities of practice. http://wenger-trayner.com/introduction-to-communities-of-practice.